The Lissajous is a family of curves in the plane that can be made by a harmonograph - linked pendulums with a pen attached. This makes a parametric curve where the x- & y-coordinates are periodic functions. This sketch has them both of the form A*sin(f*t+d). Can you figure out the role of the different parameters A, f and d? How do they affect the curve? Traditional lissajous have integer-value f, but this sketch allows you to have other rational values. What difference does that make? 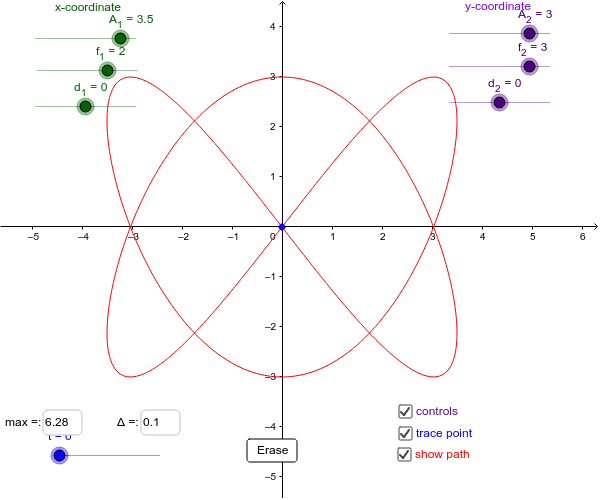 GeoGebra draws a curve like this by tracing a locus: the curve set by a point determined by a parameter (point A determined by slider t in this sketch.) Note that you may want to change the values controlling t to see more or less of the locus or the tracing point.